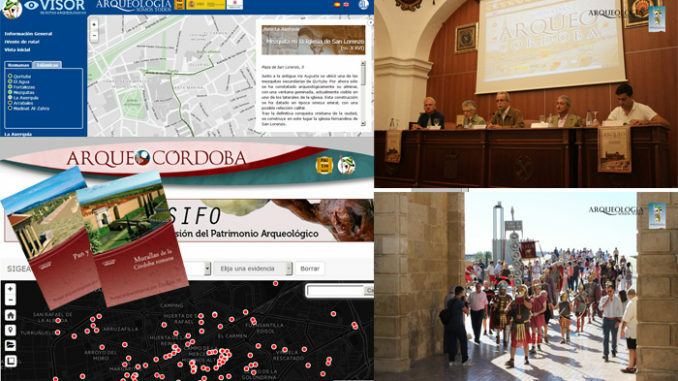 The creation of www.arqueocordoba.com in 2003 represented a before and after in the communication of the activities of the Sísifo Group and the results derived from its investigation. This pioneering platform in Cordova became a unique and unified repository of historical-archaeological, bibliographic, educational, legislative and tourist information. After 10 years of operation we decided to abandon it, due to the need to review and update already obsolete content, becoming from that moment a window that allowed access to other specific websites of the Group: gruposisifo.com and arqueologiasomostodos.com. 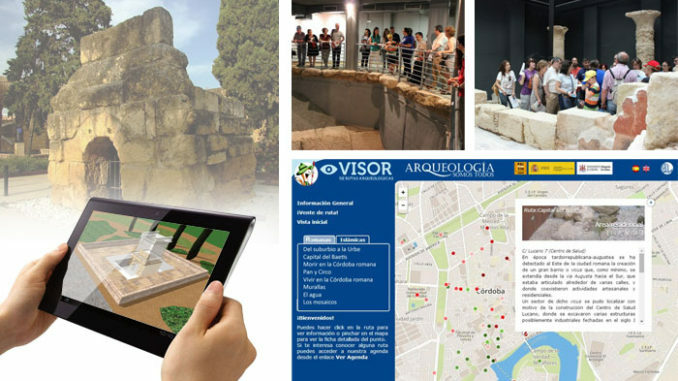 Since then, we have been working on the implementation of new virtual tools and the external and internal renewal of www.arqueocordoba.com, which was presented publicly in September. The idea is to turn it into a platform aimed at the scientific and educational community, professionals and users of cultural tourism, and ultimately to society as a whole, always with Cordova’s main thread as a unique site of extraordinary diachrony. For the scientific community we will make available the knowledge generated in the last decades of work, with an interesting graphic material that will include 3D planimetries and recreations of the main monuments of the city. At the educational level, we will elaborate a whole repertoire of didactic resources available for download, adapted to different levels of teaching. Finally, there will be a special section of tourist information. The implementation of a web of these characteristics involves a marked commitment to the transfer of knowledge and the scientific dissemination that goes through the constant creation and revision of content by the members of the Research Group, based on the generation of new knowledge own and others; Hence the need to amplify the effect of www.arqueocordoba.com and its tools, with the intention of involving all public and private groups in active participation in the web, especially as far as unpublished information is concerned (New excavations, casual findings, ancient references, etc. ), but also in the usufruct at all levels of the contents of the same for a better investigation, conservation, management and dissemination of our archaeological heritage. To transfer historical and cultural knowledge generated by our research group to society. The patrimonial and archaeological education of the citizens, from all the social spheres and educational levels. The connection of the results derived from the research production emanated from the University with the urban, economic, sociocultural and labor reality that surrounds it at present. The consolidation and extension of the ties and agreements established with public institutions, the business sector, the mass media and the professional and citizen groups related to the archaeological heritage. The strengthening of the cultural and heritage heritage of Cordova, through which it fosters the development of a new model of cultural industry that generates employment in various cultural and tourist niches. The production of informative tools of historical and archaeological character available to society. The promotion of scientific knowledge of Córdoba through a specific web platform, and with a historical-archaeological material adapted to a wide national and international audience, which promotes tourism-cultural development. The enhancement of the knowledge of the historical Cordova for researchers, teachers, tourists and citizens through various tools centralized in a Geographic Information System accessible from the web that allows a direct and simple approach to a virtual reality that, in turn, facilitates a correct and rigorous understanding of the past. The direct involvement of citizens and other heritage professionals in the investigation, protection and diffusion of archaeology in Cordova through forms arranged on the web (Protects your past and from the Earth to cyberspace). 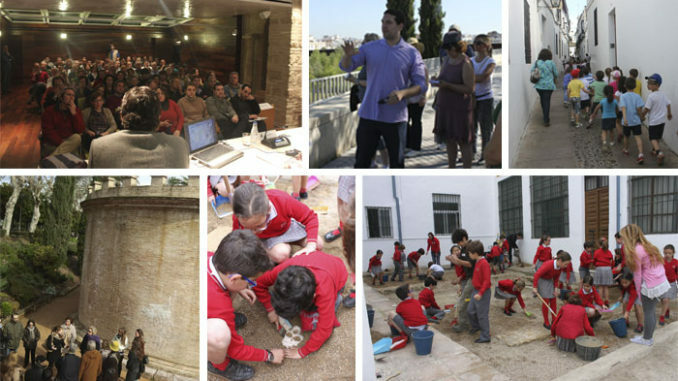 The recovery of the Jornadas de Arqueología Cordobesa, created in 1997 and extinguished in 2007 under the name I Jornadas ArqueoCórdoba, as a forum for meeting and debate of researchers and professionals of archeology. 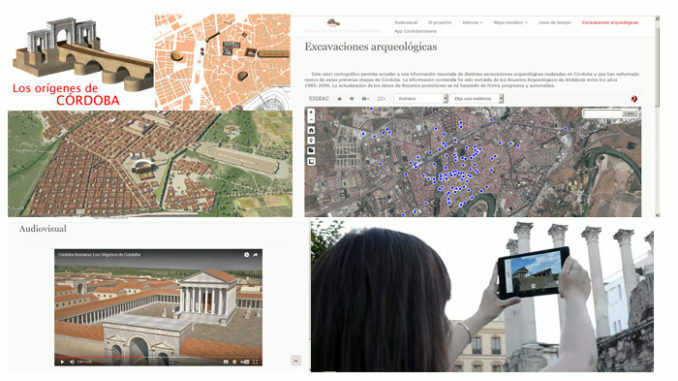 The creation of new thematic tours for the Archaeological Route Viewer. To give continuity to the monographic series Rutas Arqueológicas por Córdoba, with the edition of two new numbers centered in the buildings of shows and in the walls of the Roman Córdoba. Organization of the IV Jornadas de Arqueología Cordobesa Cordobesa(resuming the last one in 1997) for public presentation of SIGEAC, with the presence of archaeologists who have worked in Cordova in recent years and want to contribute information. Digital publication with the contributions of the conferences, which will become a reference for the city, given the enormous delay currently underway the publication of the Anuarios Arqueológicos de Andalucía by the Junta de Andalucía. Design of new itineraries for the Cartographic Viewer, especially of Islamic era: Axerquía, Madinat al-Zahra, Western Suburbs, Domestic life and Funerary world. Continuity of the monographic series Rutas Arqueológicas por Córdoba with the publication of nº 9 and 10, aboud Bread and Circus and the Roman Walls of Cordova. For this new stage of Arqueología Somos Todos have integrated various technological resources, some already consolidated today, such as cartographic viewers and three-dimensional recreations; And another more novel, like the Virtual Immersion. These innovative, rigorous and well-targeted formats can be a very effective tool for accessing to the general public, and especially the younger ones. Through them they can be educated as full and committed people with their historical-archaeological heritage, with society, in general, and with science, in particular; And, if necessary, awakening the vocation for archeology. For this pilot project we will create a virtual platform that would allow users from all over the world to know the origins of Cordova: its turdetano past and its beginnings as a Roman city, in a sort of dípolis that, according to the classic written sources and the archaeological evidences until now Known, was in force for about 200 years, until finally the pre-Roman settlement was abandoned and Cordova became the prosperous capital of the province Betica, under the name of Colonia Patricia. The 3D recreation of the pre-Roman town and the republican city will be done on a topographic plane of the territory that would have as indisputable protagonists the environment of the river and the river port, keys in the historical paper that Cordoba has played since its foundation in the prehistory. This base checkerboard would serve as a pilot project for the future to continue working in the different historical stages of Cordova, following the philosophy followed by our Research Group: unique site in a diachronic sense. Through the Internet, and thanks to a version in Spanish and English, make available to everyone, regardless the age, the latest knowledge of the archaeological heritage of Cordova in an interactive way. Involve citizens and the group of archaeologists in the management, protection and dissemination of Cordova archaeology, through a specific web service in which they can make their contributions and get involved in the R&D&I processes. To foster the collective, critical and democratic identity based on the city’s origins and its historical archaeological legacy, creating the tools and procedures for historical recreation;The intellectual, aesthetic and playful enjoyment of our heritage; And, of course, their adequate cultural and economic profitability. Develop, in collaboration with the Delegation of Tourism of the City of Córdoba, an important program that encourages family tourism in our city, and in which parents and children can interact in the knowledge. Establish an integral model of diffusion of the archaeological heritage, centered on the youngest, and that can be extrapolated to other educational levels and to more points of the city, or to other urban centers. To give the city an educational, cultural and tourist resource of the first order, capable of forming, while entertaining, motivating and opening new avenues of understanding and work. 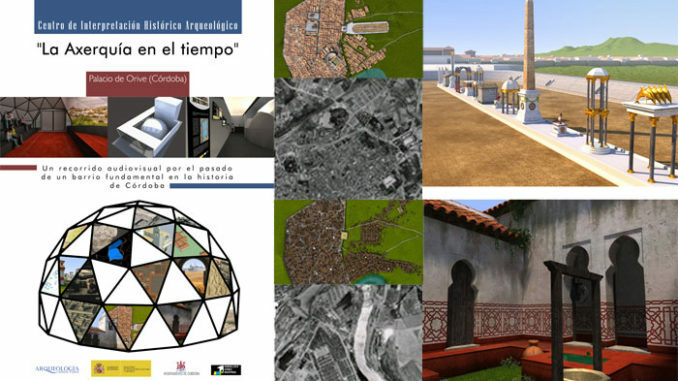 Made with open source technology, it will have more than 50 points on a current map of Córdoba with the most relevant archaeological remains of the city of the Turdetan and Roman times, connected with a technical file provided with succinct textual and graphic information in Spanish and English. The archaeological points indicated on the map, from Cordova and its province, will be accompanied by the defensive enclosures of each period, and can be screened chronologically (e.g. Roman Republican) or thematically (eg fortifications). We will prepare 20 videos of about 5 minutes duration, which will be available on our YouTube channel and will be linked to the web and the map viewer. In general, the axis of the video will be an interview with the specialist who excavated/studied the archaeological remains, in which briefly explain their nature and functionality, exposing their hypotheses and defining possible precedents, parallel and/or consequent. It will open a specific space on the web for the location and protection of the archaeological heritage of Cordova, which encourages the participation of citizens in the archaeological study of our city and province. 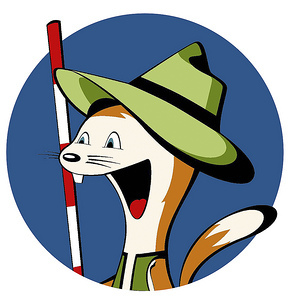 For this purpose, a web form will be enabled in which any individual can display images, information and location of certain archaeological elements not cataloged and/or studied, indicating their conservation status and if they are in danger of deterioration or disappearance. Likewise, we will enable another specific space so that any professional outside our research group can contribute information about excavations in the city. It will consist of a brief textual and visual information (planimetry, photography, videos, drawings, etc.) that will also be associated with a geographical point in our map viewer. To promote the knowledge of the archaeological heritage thanks to the use of smart mobiles and tablets, we will turn the recreations of the Pre-Roman and Roman Cordova into a Virtual Immersion tool that will allow to encourage visits to the city related to tourism, enhancing a unique experience to through a window into the past. Arqueología Somos Todos Scientific Culture Project has always stood out for its firm commitment to society, which we understand that we are obliged to transfer the scientific knowledge derived from our university work. The research carried out by the members of the Sísifo Group over the years now makes sense through serious and innovative quality publicity programs that escape misinterpretation and lack of information. Thanks to this proposal, which includes lectures, exhibitions, routes, didactic workshops and informative publications, citizens have begun to understand Archaeology as a useful science, able to offer intellectual and aesthetic recreation, but also to create identity mechanisms and, of course, cultural and economic benefits. Our ultimate goal is the consolidation of a model of archaeological dissemination capable of establishing synergies with other public-private bodies and transferring historical knowledge actively, arousing curiosity, imagination and scientific interest, in an unprecedented cocktail that combines culture, technology, education, urban and rural territory management and, most importantly, citizen engagement. In order to publicize the project and encourage participation, we will set up 1 informative table per month, which will become authentic events of divulgation next to several monuments of the city. 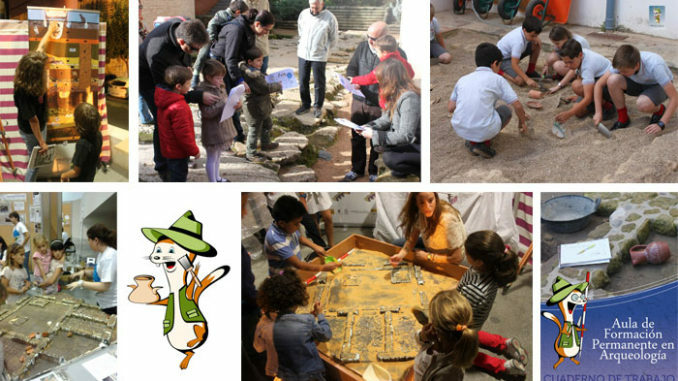 During those days the members of Arqueología Somos Todos will carry out explanations on the nearby monuments and didactic activities focused on the children’s public, with which we hope to reach a minimum of 1,000 people. Strengthen the role of the University as a generator of knowledge and an agent of dynamizationof the social environment in which it carries out its work. Strengthen the cultural heritage of Cordovato promote a new model of creative cultural industry and entrepreneurship with the capacity to feed back and, consequently, generate quality employment. To give a new impetus to the dissemination of archaeological heritage, so inaccessible at times, through the use of new technologies and the production of online digital content;Always based on sustained research. To consolidate and expand the linkswith public administrations, the business sector, the mass media and professional and citizen groups related to the archaeological heritage, culture and the tourism sector, promoting, in the end, the association and the cooperation. Imbibing the results derived from the research producedby the Sísifo Research Group and other professionals from the world of archaeology with the urban, economic, sociocultural and labor reality of our city, simultaneously seeking the involvement of new economic agents that guarantee sustainability of that. To enable society to have direct contact with the archaeological evidenceof the Cordoban plot and the problems involved, stimulating the involvement of citizens. 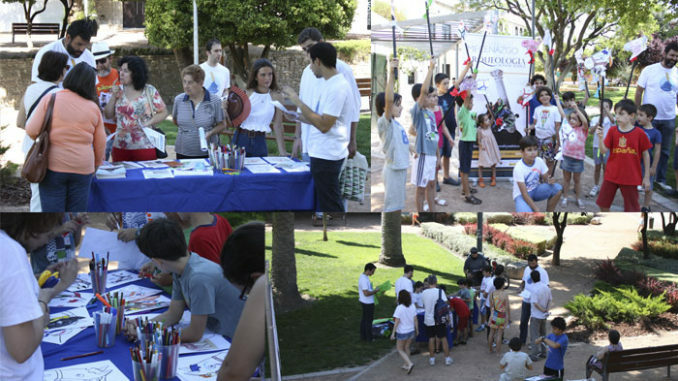 Informative tables in different patrimonial points of the city, where guided explanations of the nearby monuments will be made and didactic workshops related to the theme for the young ones will be developed. The project “Cordova in history. Archeology, tourism and new technologies” contemplates the creation of a network of centers scattered by important historical points of the city, usually outside the tourist routes, which promote the expansion of visitors to places less frequented. We intend to create an urban “synapse” for different points disconnected today in the Cordova topography, to diversify tourism and to prolong the stays and overnight stays of visitors, and to promote consequently the generation of employment and economic income. At each point, chosen strategically, a center of general interpretation of the concrete historical sector will be established, linked to a wide open space in which the most important remains exhumed in a concrete site will be explained in detail, with a great display of technological means, and inaccessible today. For this specific project, as a pilot experience, we will develop a first phase in a neighborhood of Cordova barely exploited tourist, despite its significant historical-archaeological potential: the Axerquía. The place chosen for this sector is the Palacio de Orive, near the urban center, and a few meters from the Town Hall and the Roman temple, which will facilitate the flow of visitors. In the same Palacio de Orive will be installed a center of historical-archaeological interpretation of this eastern sector of the historic center of Cordova, with more than 100 hectares. In turn, it will be interrelated with Parque de Orive, under whose subsoil remain today the remains of the Roman circus and a residential Almohade neighborhood, elements that will star in a three-dimensional night-time mapping show in the same place. Give a new impetus to the dissemination of the Archaeological Heritage, sometimes one of the most inaccessible, with the use of new technologies in situand the production of online digital content for a specific website, available in Spanish and English, as a complaint to national and international tourism. Expand the historical-archaeological tourism of Cordovato places little exploited, increasing considerably the tourist offer in our city and promoting its modernization. Create a local tourism-cultural development platform that enables unattended urban sectors with the implementation of creative measures. Encourage the participation of local companies and self-employedin our project, closing agreements with the recent companies of “heritage interpreters”, which have dynamically endowed cultural tourism in recent years. To create a complex and long-term “synapse” in the citythat involves very diverse public and private sectors, traditionally disconnected, in pursuit of a common goal: the dynamization of cultural tourism in Cordova. You will have different didactic material (posters, projectors, reproductions of three-dimensional objects, etc.) distributed strategically and chronologically. In this space, the visitor will understand the diverse and complex history of the Axerquía through a free route and the projection of a videomapping. After the housing crisis, and the adverse effects it has had on urban archaeology and the economy, it is time to reflect and demonstrate that there are alternative, and more effective, ways of addressing the past; That is, archaeology as a common legacy capable of enriching the patrimonial and tourist offer of our historical cities, while multiplying its attractions and its projection in the world. An objective that is most transcendent, if possible, in complicated times as we live; That is why we demand education in all age groups and social, professional qualification, entrepreneurship, imagination, multidisciplinarity, innovation and the sense of commitment as determining values ​​on which we can lay the foundations for tomorrow. Based on the experience accumulated by Arqueología Somos Todos, and thanks to the support received from the Ministry of Education, Culture and Sport, we have designed specific services that, through the new technologies, will allow the public (local and foreign) the results on research and heritage management of one of the most important historical capitals of the Western Mediterranean. The inaccessible archaeological excavations, private or public, the conservation of archaeological remains in private plots, in basements of difficult access, little or no textual and graphic information that accompanies many monuments integrated in outdoor spaces, the absence of a historical, etc., have formed a hidden, underground and invisible Cordova that we intend to show by means of multiple routes. Strengthenthe cultural heritage of Cordova, through it, to promote the development of a new model of cultural industry that generates employment . Consolidate and expandlinks with local and regional public administrations, the business sector, the mass media and professional and citizen groups related to the archaeological heritage, culture and tourism sector. Connectthe results derived from the research production emanated from the University with the current urban, economic, sociocultural and labor reality. To enable society to havedirect contact with the archeological evidence of the Cordoban plot, but also with the urbanistic problems of the present city. Educate the citizen and the visitorthrough a correct dissemination of a scientific base that values ​​the archeological heritage of Cordoba in its right measure, stimulating citizen participation and national and international promotion. Give a new impetusto the dissemination of the Archaeological Heritage, sometimes one of the most inaccessible, with the use of new technologies and the production of online digital content for greater dissemination, both within Spanish territory and abroad. Cartographic Viewer: Made with open source technology on a street in the city today, this interactive and online application allows you to visualize historical tours of Roman and Islamic Cordova through our website, on own initiative or prior to the completion of a programmed route. Each point on the map that marks the site where an archaeological site is located is linked to a technical file with textual and graphic information in Spanish and English (http://www.arqueocordoba.com/rutas/). 3D recreations: people not versed in archaeology or planimetric readings, need the volume to properly understand the remains.Aware of this, we are proceeding in a progressive way to the digital reconstruction in three dimensions of important Roman and Islamic vestiges of Cordova, carried out jointly by researchers, computer scientists and draftsmen specialized in the subject, that allow the user a better understanding of the structures without missing at any time to rigor or reality. Routes. Each of the designed routes were offered in different formats (virtual, traditional and digital), so that the public could choose the one that best suited their circumstances and preferences. Digital was undoubtedly one of the most innovative, integrating traditional information online via smartphones or tablets. In this way, the attendees had the possibility to access live three-dimensional recreations, photographs, planimetry and other multimedia material, which made the experience unique. With the same philosophy that has always accompanied us in Cordova, a historic city with an enormous extension and complexity as a site, developing a full program of dissemination (conferences, routes, workshops, exhibitions, etc.) of great social and institutional reception, we thought it necessary to extend our geographical boundaries to record that the archaeological event takes place beyond the capital of Cordova. Our purpose is, therefore, to extend our model of action to the province, whose patrimonial wealth is evident in the concentration of local Historical-Archaeological Museums, the largest of all Andalusia, and in the presence of some of the most significant archaeological sites of Spain, many of which have gone unnoticed for the capital itself and even for the nearby municipalities. However, the scope and complexity of this proposal required the implementation of an initial phase, with short and medium term objectives that would allow us to verify the feasibility of the different actions and activities proposed. For this pilot project, we have chosen two locations with exceptional archaeological resources, although with a geographical situation and very different idiosyncrasies: Puente Genil and Peñarroya-Pueblonuevo, which will act as experimental laboratories and epicenters of the regions located in the vicinity of Valley of the Genil and Valley of the Guadiato. Thanks to the experience of our team and the involvement of the different collaborating institutions of both municipalities (Puente Genil Town Hall and Cuenca del Guadiato Foundation), we will make known to the general public – local and foreign – interesting results on research and management of equity generated in Puente Genil and Peñarroya-Pueblonuevo during the last years, with the ultimate aim of making the company the custodian of that legacy and co-participant in the responsibility of maintaining it and making it profitable as an important tourist and socio-economic resource. In addition to contributing to the research, interpretation, protection, conservation and valorisation of the archaeological heritage of these localities, we have as the ultimate goal the configuration of an archaeological diffusion model extrapolated to any other municipality in Cordova, based on collaboration between different institutions and entities both public and private, and in the training of creating networks or cooperation platforms between the capital and the province that allow a greater social, economic and cultural dynamism. Give a new impetus to the dissemination of the Archaeological Heritage of our provincewith innovative and accessible formulas through experienced and highly qualified professionals who, in addition, generate this historical-archaeological knowledge. Strengthen the archaeological heritage as an educational resource, a dynamization factor and employment site, all with a vocation of sustainability. 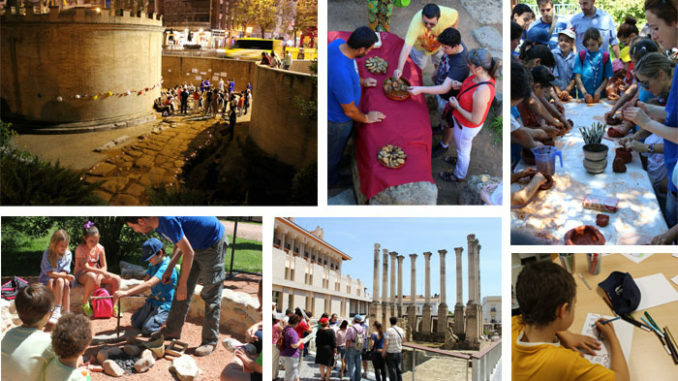 “Nights in the Villa”: nocturnal dynamization program for the Roman Villa of Fuente Álamo (Puente Genil), organized during the summer months.It included film screenings, illustrated lectures, oil and wine tastings, historical recreations and guided tours, with a total of 1,273 participants. Seminar of Heritage Spaces: its objective was to make known the value of the mining-industrial heritage of the Guadiato Valley area, so after the morning lecture we made a route through the town of Pueblonuevo that passed through the Industrial and ended up in several mining enclaves of the environment, explained with the collaboration of some of the survivors who worked in them. 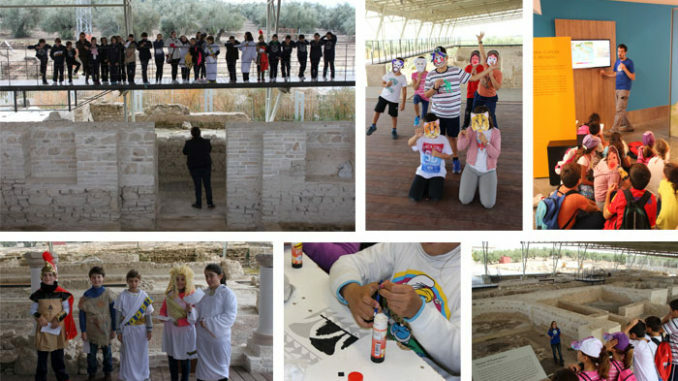 Workshops: In the case of Puente Genil we designed a visit packto the Roman Villa of Fuente Álamo directed especially to primary school students and consisting of a theatrical visit to the site and a workshop. For Peñarroya-Pueblonuevo we have the collaboration of the local institutions interested in invigorating the Christmas holidays with workshops on Industrial Archaeology, through which excavation methods, clothing, tools and machinery were explained, etc. Routes: In the framework of the proposals “Daily life in the Roman village of Fuente Álamo” and “Roman Villa of Fuente Álamo, producing center of the Bética”, and always with the collaboration of the local Town hall and the personnel of the archaeological group headed by Manuel Delgado Torres, we made guided tours in the mentioned site, complemented with explanations in the Archaeological Museum and tasting of wines in a local winery. If we want to guarantee future research, protection and valorization of the archaeological heritage, the education of the young becomes a key part of our work. For this, in this continuous evolution that characterizes Arqueología Somos Todos, we designed an ambitious program of work that surpassed the classic models through innovative strategies adapted to the different levels of education, with the ultimate goal of educating full and committed citizens with its historical-archaeological heritage, with society, in general, and with science, in particular; In addition, of course, to promote vocations in archaeology. The center of operations was, once again, the Faculty of Philosophy and Letters (UCO), located in the historic center of the capital of Cordova, where we now gave an official letter to the Aula de Formación Permanente en Arqueología: a laboratory of experimentation based on the joint work between teachers and students through direct contact with sources and practical exercise. To stimulate the society from its rootswith the diffusion of the scientific culture among the youngest, integrating the university research in inferior educational levels. To fosterscientific curiosity and experimentation among the youngest, initiating them in the rudiments of research and scientific methodology through the different phases of the archaeological work, so as to make the critical capacity and creativity emerge from an early age. Eliminate clichés and present Scienceand Archaeology in an entertaining way, with the purpose of increasing students’ interest in a discipline that bases its principles on the hypothetico-deductive method. To develop new technological formatsfor pre-university students, thus offering them a more pleasant and attractive environment in our traditional educational activities of scientific dissemination. To set up didactic and interdisciplinary resourcesthat allow the exercise of the most useful skills for life and future careers, such as teamwork and the management of new methodologies. Workshops: They were developed mainly in the simulated excavation (that in colloquial language we know like Arqueódromo) with educative centers of Cordova and province, captured through the catalog of activities available in our web page.To give practical workshops on archeology and others related to the daily life of Roman and Islamic times, we added on this occasion the development of didactic materials, such as the Cuadernillo del Arqueódromo, which aimed to guide the different phases of the visit: from some notions Previous concepts and concepts of work, to the organization of the team, the exhaustive collection of information and, of course, historical interpretation. Archaeological routes: In addition to offering didactic itineraries for the historical center for the students of the different educational centers that visited us, we started the program Archeology in family, aimed at promoting joint learning between adults and children, thus stimulating a favorable environment for awareness patrimonial and implicit values ​​of identity.The adaptation to the discourse was made by didactic material starring our mascot, the weasel Claudia, who was proposing games and puzzles to solve during the visit. Conferences: On this occasion, we specially adapted our commitment to bring the archaeology as a science and as a profession to the younger audience;Hence our participation in activities such as La Noche Europea de los Investigadores, Café con Ciencia and Jornada de Puertas Abiertas for high school students, all of them organized by the University of Córdoba. ICTs:To the original infrastructures and methodologies introduced in past projects we now join the use of ICTs which, treated with rigor, have since enriched our educational work, allowing us to overcome habitual defects, such as passivity or superficiality, with novel proposals based in interaction and creativity, in reflection and critical thinking. The video game Virtual Archeology. Learn to be an archaeologist (web and android version) and Virtual Gymkana by the Historical Center (for Tablets) have become two game/learning tools adapted to the new times through technological formats of great appeal to students. About two and a half years ago, the Sísifo Research Group of the University of Córdoba decided to raise the pillars of an ambitious university transfer program with the intention that the Cordovan society would make its own something that already belonged to it, but that nobody until now he had stopped to explain, his past. After an intense investigation of the historical-archaeological Cordova throughout the first decade of the 21st century, we believed it necessary to put at the service of society the knowledge accumulated during so many years of work through the project Arqueologia somos todos, convinced that only if the citizenry perceives and understands what Archaeology represents will learn to respect, defend and care for it. This project, which is directly linked to the philosophy of scientific transference defended from the FECYT, was presented to the last call with an ambitious and eloquent subtitle: “reinventing the future”. Thanks to the help offered from FECYT, Arqueología Somos Todos developed its 2012-2013 season stronger than ever; With a backing and citizen participation that increased continuously. This enthusiasm we are generating by archeology, favored by the generous contribution in our project of prestigious internal and external researchers , and, of course, by close collaboration with important institutions (University of Córdoba, Faculty of Philosophy and Letters, Casa Árabe, Vimcorsa, House of Sepharad or Diocese of Córdoba), has resulted in several prizes and awards , and especially in the support of the Obra Social Foundation “la Caixa”, which chose us as one of “the most outstanding scientific culture that are developed in our country“. The transfer of historical and cultural knowledgegenerated by the intense scientific activity of our Research Group to the population of Cordova, arousing curiosity and scientific interest, as well as creativity and innovation at all levels. The promotionof innovation from the University. The promotion of experimentation among the youngest to bring science closer and promote a culture of innovationfrom excellence. The elaboration of informative works of archaeological characterthat complement our activities, to provide to all levels of the society a useful and lasting material support, at the same time that they become useful tools for the teachers. The creation of synergies with other organismsin search of a new model of cultural management, which opens new perspectives within the field of archaeology. The consolidationof an archaeological dissemination model for Cordova that can be extrapolated to other urban centers. The “archaeological routes”, directed by specialists belonging to the Sísifo Research Group.In addition to our classic routes, for this call we also include a series of thematic tours: Strengths for uncertain times, Vestiges of the Guadalquivir, Waterways or Walls and gates of the Axerquía). The proposed lecture series(Desvelando la Córdoba Arqueológica, Arqueología y Sociedad y Nuevas sendas de la arqueología) have been carried out with the support and collaboration of important Cordovan institutions (Casa Árabe, Vimcorsa, Diocese of Córdoba, Casa Sefarad, Faculty of Philosophy and Letters and Rector of the University of Cordoba), which has allowed us to establish an important network of collaborators that has exponentially multiplied our dissemination, penetrating in different sectors of society. With the children’s workshops we wanted to specifically serve the younger audience from a perspective adapted especially to them. Through the various thematic workshops of archeology (all with a simple and agile tactile and visual component), we wanted to teach the little ones this scientific discipline in a fun and entertaining way;While at the same time becoming aware of the value of the historical-archaeological heritage. Perhaps, the most important element of all these activities has been our Arqueódromo, built in the Faculty of Philosophy and Letters of the University of Córdoba.It is a simulation of an archaeological excavation (with materials similar to real and real scale) that reproduces part of a street and a medieval islamic dwelling, built on a previous phase of Roman burials (of cremation and burial); All partially amortized by a contemporary well. The purpose of this interactive recreation is to show the process of an archaeological excavation, highlighting the value of the set in front of the object, or how through the material remains can reconstruct the life of past cultures. Following the opening to the public of the Roman Temple of Claudio Marcelo Street in November 2013, the local Consistory, and especially its Delegation of World Heritage and Historic Town, launched a campaign aimed at vindicating the Roman past of the city, with the intention of increasing the three cultures traditionally linked to the city to four (Roman, Christian, Jewish and Muslim).Discover the Roman Cordoba sought to rescue from anonymity the most classic stage of Cordoba, often unnoticed under the appeal of the Mezquita-Cathedral of Córdoba and the surroundings of the historic center in which it is inserted. Present and involve Cordovan society with its Roman past through archaeological routes, didactic workshops and informative days. Routes: visited the most significant archaeological remains of Roman times preserved in the city, but not always accessible to the general public.We developed a prototype of didactic guides that had a great acceptance, and we made available to the public ten Tablets with textual, graphic, planimetric information, games and curiosities. Workshops: with high didactic content and certain touches of historical recreation, the workshops concentrated on this occasion, as a novelty, in the City of Children;A recreational space of familiar character that saw Roman soldiers and matrons, gladiators and craftsmen in charge of elaborating adobes following the constructive techniques of the antiquity. Floralia/Rosalia: The months of April and May of the Roman calendar were plagued with feasts dedicated to spring and the dead, to celebrate the regeneration of nature and life, as a transcript of immortality.To this end, we returned our lives to one of the most well-known archaeological sites in the city, but more forgotten: the funerary monuments of Avda. De la Victoria: guided visits, flower and lamp workshops, and evening readings of old texts with legends allusive to the world of deaths occupied a full day that was settled with almost 500 participants. Drawing Contest: Free technique, and aimed at children between 3 and 13 years, this contest was intended to check the involvement and knowledge of the children about the Roman past of the city of Cordova. The decision of the jury took place in the City of Children, where we had the opportunity to meet in an impromptu exhibition the more than 400 drawings sent to the organization by individuals and various schools. I Days of Archeology in Family “Turdetanos y Romanos”: As a culmination of the program, we returned to make the City of Children a space of reunion with the origins of Cordova.Children and adults immersed themselves in the Turdetan and Roman past of the city through exhibitions, competitions, workshops and games, as well as a gastronomic tasting based on the recipes of the classical authors.